This instalment of You Make the Call features a school board employee who faced charges involving minors. A caretaker for the Toronto District School Board was arrested in May 2010 and charged with sexual interference and sexual assault involving a girl under 14. He had been employed with the school board for more than 20 years. The school board learned the charges stemmed from incidents involving his stepdaughter and his release pending trial required him to stay away from anyone under 16 years of age. He was initially placed on paid suspension, and when the school board received official copies of the charges, it placed him on unpaid suspension and sent an investigator to the preliminary hearing. 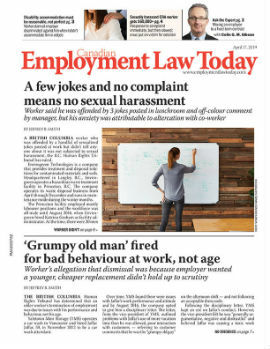 It had a policy that stipulated when an employee was charged with a criminal offence, the employee would be assigned to alternate duties not involving contact with students until the charges were resolved. If an employee was convicted or an internal investigation determined there was a sexual assault of a student, the policy stipulated that the employee would be terminated.